Frame type (Yo!, Wicked, etc. ): Yo Eddy ! Manufactured: 1991 in Sommerville, Mass. Color: origianally Metallic Teal, Soon to be Ruby red pearl metallic. Bike is currently being refurbished by Ted Wojcik. Name: Bill Davis, original owner. Last edited by Digger90; April 14th, 2006 at 2:47 AM. I've still got some of the original FAT paperwork that came with the bike 12 years ago. Brought the frame second hand about 8 years ago, still going strong. 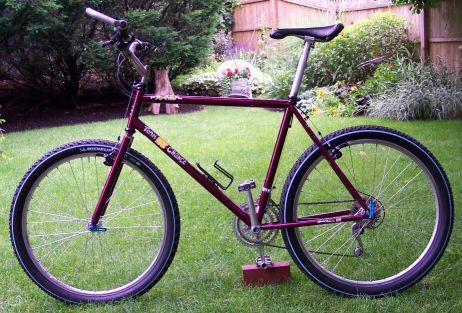 Bought it new from Outbike bikes in Atlanta (frame only) in 1994. I decked it out with Ringle seatpost and stem, Grafton Cranks, Avid Tri align brakes, Nuke proof wheels, XTR/Gripshift. It's a single speed now, repainted in 2000. Color: Yellow to Hot Pink Fade !Fluorescent! Last edited by Zook; June 6th, 2005 at 4:37 PM. by the serial number I would guess that your bike is a 90, does that sound about right? greetings to all fatcogs from the bavarian alps! here's my Fat Titanium - parts aren't final - still missing nice cantilevers etc. Nice Ti! It's all a man need! Year of manufacture: 1990 ? Year of manufacture: 1998 ? You have quite a nice collection of bikes. The teal color is one of my favorites, don't see it often. Based upon the serial number, I would guess that your Wicked is a 1991. Thanks Rick, it had hung in a local shop for a few years before I got it, so I wasn't to sure about the year. Frame has a new home back in OR of all places to Afterbang! Owner name: Melvin aka Yo Eddy! since 2003. Previous owner Shawn from Concord, NH, US. 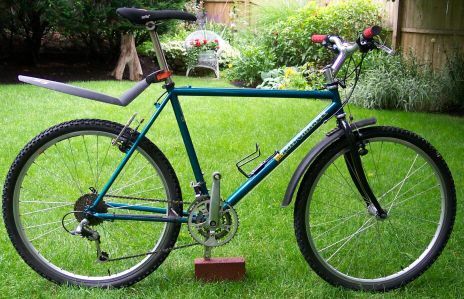 Bike originally sold by James McDonough's Pedling' Fool Bikeshop in Hillsboro, NH. Owned both since new they now gather dust since I discovered full suspension. Purchased them at Wheel Precision in Lake forest California. Robert Savage built them. serial number 033P3ML does this sound correct and would it indicate that it is a M/L because i feel like it is a S/M. The serial number would indicate that it is a M/L, which is generally an 18" frame in Fat sizes. The serial number is sort of puzzling, though, as the "P" in the middle is an oddball and not normal for Shockas. Interesting. I measured the top tube and it is 22.5 inches which would indicate a S/M If i was looking at the specs. sheet correctly. and that is the serial number I checked it agian. 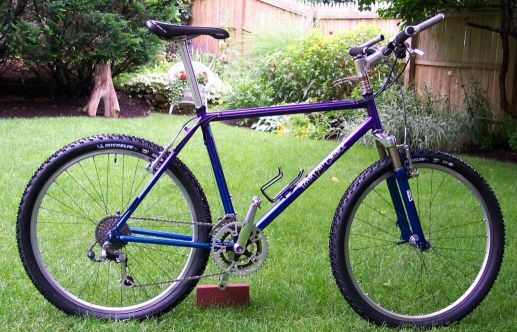 where do you measure the seat post from? The top tube length is measuered center to center parallel to the ground. I would never think to measure that way, so that would lead me to believe your actual number to be longer than you think. A M/L would be 23.3 inches, center to center. Check the seat tube length, measuring from the center of the BB to the center of the top tube. My guess is it is 16". yes i would love to sell the frame and fork. I am trying to find a M/L yo to replace it. i just measured it and it is 16inches. I really would like to trade for a yo Eddy or possibly put it towards a titanium. 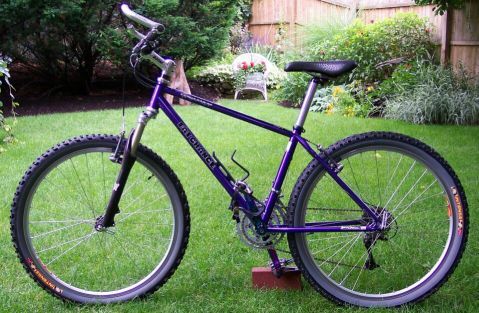 Is this the bike that was sold on ebay in June for $800.00 and located in Winchester VA? The seller gave a serial #033PSM which seemed odd to me. If it is the same bike I bid on it as well and would be interested in the bike if the size is S/M. Thanks. I have a frame only, from ebay for $120. I believe it is a wicked fom about 1987, but I'm guessing here. Busy finding 1987 era parts to build it! I purchased it via San Deigo and now it's in Australia. Just started the build up tonight on the following, (switching components over from a mid 90's Buck Shaver). Location: Mendip Hills , Somerset, U.K. The frame has had a long life already 'across the pond'. It had just been repaired by Independent Fabrications when I recently acquired it. A photo to follow once it hits the (muddy) Mendip trails! In August 2009 I discovered a crack running thru the IF repaired weld. Contamination seems likely to be the cause for failure...and ragged hard winters of riding! Looking into the possibility of a repair but it's seems tricky & super costly.